Our product range includes a wide range of industrial tube light, taba led tube light, 20 w 1 feet cuteon led tube, led tube lights and industrial tube light with reflector. We are the Leading Manufacturers of LED Lights Fixtures for the past 25 Years the Only Manufacturer of Industrial Tube Lights with Reflector in Coimbatore. Our organization has gained recognition for providing premium quality LED Tube Lights. Highly applicable for use in showrooms and shopping malls where the true color of the product is to be represented, offered down lights are designed by using high grade raw material and modern technology under the vigilance of adroit professionals. Our LED Tube Lights are available in variegated designs and specifications as per the demands of the clients. Apart from this, clients can avail these Flood Lights from us at nominal prices. we are engaged in offering a qualitative range of LED Tube Lights 1 Ft, 2 Ft & 4 Ft for both Office & Residence that have smooth texture and assist to reduce the electricity to great extent. The offered tubes are manufactured by using high grade raw material and advanced technology in sync with set industry standards. Furthermore, these tubes are tested on different parameters by our quality examiners for assuring their quality at clients’ end. We are recognized as a prominent manufacturer and supplier of a comprehensive assortment of LED Tubes for both Industrial & Domestic Use. Our offered Tubes are manufactured using the finest quality raw material and progressive technology in compliance with the Industry standards. Before final delivery from our end, these Tubes are checked by our Quality Examiners. Used in commercial places, our provided Tubes can be availed in different designs and sizes. 20 Plus more Wattage, 4 Ft Tube with Reflector, 1200mm Length & 70.778 mm Width with 28.552mm Height. We are the Leading Manufacturerof LED Lighting & Fixtures. 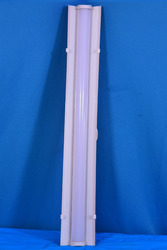 Our New Product Introduced is the Industrial Tube Light with 20W, 4 Foot Tube with Reflector. All our Products are purely based on our Customer's satisfication. Hence we have a very Flexible pricing policy. 4Ft Industrial Tube Light is available with 20Wattage of 1200mm Length, 70.778mm Width & 28.552 mm Height. Wattage can be increased as per the customer Requirement.